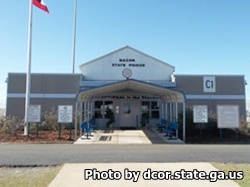 Macon State Prison is located in Oglethorpe Georgia. It is a closed custody institution that houses approximately 1762 adult males who have been convicted of committing a felony. Inmates are housed in either an open dormitory, single cells, or double cells (cells with two beds per cell). Work crews at this facility include landscaping, maintenance, laundry and food service for the institution. Inmates have various programs designed to give them an education or vocational skill. Academic courses offered at Macon State Prison include a GED course, adult basic education, and literacy classes. Vocational skills taught at this institution include culinary arts, computers, barbering, custodial and building maintenance, landscaping, clerical worker, horticulture, and customer service. Visiting is on Saturdays, Sundays and Holidays 9am-3pm on a rotating schedule depending on the first letter of the inmate's last name. January-July 2015 inmates A-L will have visiting on Saturdays, M-Z will have visiting on Sundays, Holidays all inmates have visiting. August-December 2015 inmates M-Z will have visiting on Saturdays, and inmates A-L will have visiting on Sundays.